Requirements: A Java SE Runtime Environment (version 5.0 or greater). For discussions, please use the mailing list, or optionally the sourceforge forum. It can read the file systems HFS (Mac OS Standard), HFS+ (Mac OS Extended) and HFSX (Mac OS Extended with case sensitive file names). HFSExplorer allows you to browse your Mac volumes with a graphical file system browser, extract files (copy to hard disk), view detailed information about the volume and create disk images from the volume. A user of an Intel Mac running Windows with Boot Camp in need of accessing the files on the Mac OS X hard drive. People that need to access the contents of HFS+-formatted .dmg / .sparsebundle files. HFSExplorer is written mostly in Java 5, optionally using some Java 6 / 7 features, with some Windows-specific parts written in C in order to be able to get raw access to block devices, and to create a practical launcher application. Linux and OS X users should in most cases not need HFSExplorer for browsing file systems on devices, since there are native file system drivers available on those systems, but it seems to work fine if you need it. Linux users might find use for opening .dmg / .sparsebundle files. First make sure you have Sun's Java SE Runtime Environment version 5.0 or greater (OpenJDK works fine). Second, make sure you have administrator or equivalent privileges if you're going to access physical disks. Windows users only need to download the convenient installer (see the download links the top of the page), which will do everything for you. The installer will place two shortcuts to HFSExplorer in its start menu folder. The first, "HFSExplorer", simply opens the application. If you are an administrator running Windows XP or Windows Vista with User Account Control disabled, you will be able to access block devices. The second shortcut, "Run HFSExplorer in Administrator mode", makes it possible to elevate your privileges. In Windows Vista, this is done with the User Account Control dialog, and in Windows XP a similar but not as fancy dialog is shown to make it possible authenticate as an administrator. 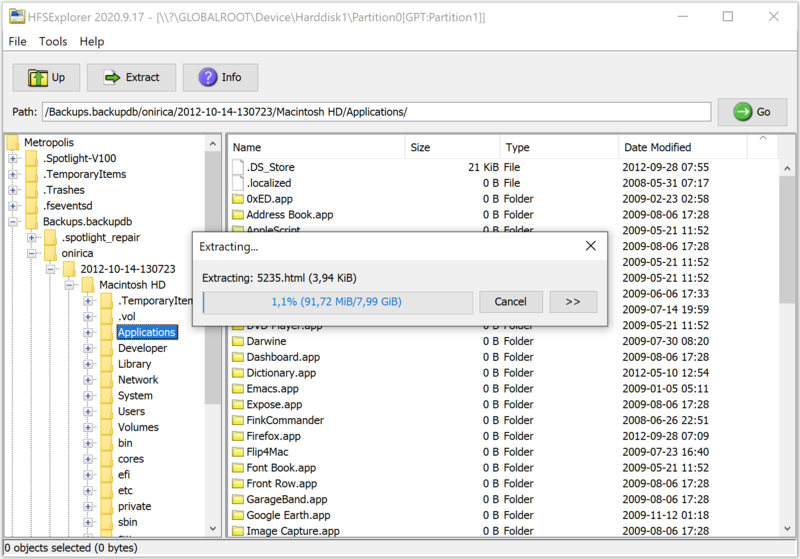 If you want to access a partition on the disk of your computer, and you run Windows Vista, you should always start HFSExplorer in "Administrator mode". Users of Linux, Mac OS X, FreeBSD (and Windows users too, if they can not run an installer by any reason) can download the zip-file binary distribution (see top of page). Extract the zip file to a directory of your choice. *nix systems can use the hfsexplorer.sh script to start the application, and Windows users can use the file hfsexplorer.bat. Windows Vista users can conveniently invoke UAC by running the VBScript hfsexplorer_vista.vbs. There is also a minimal unmaintained text mode program for HFS+ only, which is started by invoking hfsx.bat/hfsx.sh. Invoking the script file with no arguments prints usage instructions. This is for when the HFS+ file system is located on a file inside the current file system. One example is when you want to load a .dmg or .sparsebundle disk image. Another example is when you're on a UNIX-like system and want to access a block device (the file would be something like /dev/disk0 or /dev/hda). Partition systems (Apple Partition Map, GUID Partition Table and Master Boot Record) will be autodetected if present. This is because block devices in Windows are not as easily accessible as under UNIX-like systems. The user will be presented with a dialog where it can choose which partition to read. Hard disks are enumerated from 0 upwards. Partitions, on the other hand, are enumerated from 1 and upwards, with Partition0 representing the whole drive. Keep that in mind when looking for your Mac partition. If there's nothing in the list, take a look in your system using WinObj from Sysinternals to see if you can find what you are looking for. The program is released under the GPL version 3. It operates in read-only mode so it is virtually impossible for it to cause any harm. I'm always in need of feedback, so please email me if you have any suggestion on how to improve the application. As usual with software like this: It is provided for free with no warranties.